Catalogs sell products, but also the company’s values for that period of time. Seed and nursery catalogs might offer seeds, bulbs, vines, shrubs, trees, and even house plants. They also incorporate the company’s ideas about their business at that particular time. 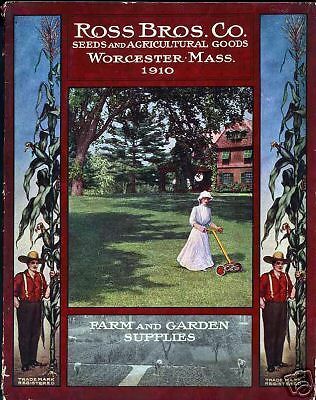 In the 1910 garden catalog [left] from Ross Brothers in Worcester, Massachusetts we see the catalog cover with a woman cutting the lawn. The company might have appeared modern – encouraging women to do what they want, even cutting the lawn, at a time when women wanted more freedom in both the home and in civic life. Whether or not the company sold more lawn mowers because of this cover we don’t know but we can see the company recognized a new role for women in society. That the freedom for women meant they, rather than men, cut the grass might seem trivial but that difference is how Ross chose to express it on the catalog cover. So perhaps Ross simply reflected the changing role of women.